Yesterday was quite an exciting day. I had quite a few driving challenges, but I made it through the day. I just took it really slow, ignoring the irritated drivers behind me and kept in my lane. Although my nerves kept chewing at my composure, I remained calm. 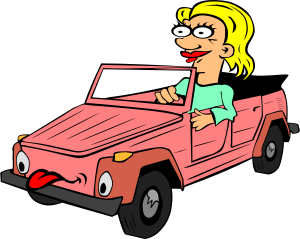 If I panicked, my sister would have panicked too, as she is not used to people driving her around. Luckily my sister knew exactly where we had to go; it was just a matter of me never having driven there before. I ended up spending most of the day in the car yesterday, taking my sister on unplanned errands, but it was all okay in the end. I didn’t have an accident, which I had dreaded, which is all that matters really. But let me tell you, I slept like a baby last night after all that driving. It has been an interesting few days. My brother is away at a conference for a few days and my one sister, the second best driver, has had an accident with her chef knife and now her hand is stitched up and in a sling, which means that I get to be the new number 1 driver for the family. I have to take my oldest sister to the train station in the mornings and fetch her at night, which I totally don’t mind. I think it’s great that I get to drive more. Usually I’m one of the last people they ask to drive. I guess what counts in my favor is that my mom doesn’t like driving anymore, so I got moved up in the ranks. I know it’s not something big to be excited about, but it’s a change. My biggest driving challenge is going to be tomorrow when I have to drive my sister to Stellenbosch to have her hand re-examined. Now I have been to Stellenbosch a hundred times, great town, but I have never driven myself there before. Okay, there was that one time and I drove up the wrong side of a one-way street, but it wasn't my fault. There wasn’t a clear sign to tell me it was a one way street and the streets in Stellenbosch are really narrow and…Don’t worry, I will be fine. I will look at it as an adventure. Besides, it has given me something to blog about that isn’t depressing. I will let you guys know how it went. Please stop killing and hurting innocent animals. They have done nothing to you. They were created just like we, humans, have been to roam this earth and they have the equal right to live, exist and be free. Please stop ruining our heritage. Stop killing our wildlife. Stop taking away our future. Stop ruining this planet. Please stop all the killing. Not only is our planet dying, so are our wildlife. Wild animals are currently being poached to the point of extinction and soon the only way we will see a wild animal like the lion, elephant, rhino, etc, will be on the internet. Soon there will be nothing left for the future generation to enjoy. I don’t know about you, but to me that is tragic. In South Africa, my country, rhinos are being killed every few hours and it sickens me that more can’t be done by the government to protect these precious creatures. Today my world just seems a lot bleaker. Understanding something and actually doing it is a lot harder than one thinks. I know what active voice is. I have spent hours surfing the internet looking for great examples of what it should read and look like. Now, actually going back to my manuscript and re-writing everything in the active voice is not that easy. I know what I should do, but knowing how to do it is where it gets hard. I know what I should do, but I don’t have a great understanding about what active voice really is and when I am using it. In certain instances, passive voice still sneaks in. I am not ashamed to admit it, but I am very slow on the uptake. I mean come on, correcting a bad habit is hell, but it doesn’t mean I won’t get it eventually. I just have to give myself the time to understand it properly. I have to accept and get over the fact that it might take me a while to learn all that I need to and I won’t be learning all of it in just a few days. What is my rush anyway? I have figured out why I haven't been in the mood for writing. I am the kind of writer that likes listening to music when I write or even when I 'm simply trying to get into the mood to write. At the moment I haven’t really listened to any new music and none of my old stuff really compels me to write at the moment, probably because I have used them to write my old work. Now I need new inspiration. It also doesn't help that I don’t know what kind of music I am really in the mood for. I will know when I hear it. I have decided to focus all my attention on learning writing techniques and understanding them. So I won’t be doing any writing until I have learnt how to fix the mistakes that I have been making for the past 10 years. What is the point if I am just going to keep making the same mistakes over and over? So I will be learning and reading. My brother made an interesting point the other day, about how I don’t really understand all the rules about writing, because I write in English and English is not my first language, meaning I didn’t really learn all I had to. I just assumed what I knew would be enough. I tell instead of show. I write in the passive voice, instead of the active. I am not good at descriptive writing. My dialogue writing is not very good either. These are only a few mistakes, but to me they seem like a huge deal and I am well aware that they are the writing basics. Now you understand why I am rather going back to the beginning so that I can learn how to write. I can’t believe I actually thought my work was good before, when all these mistakes were there all along and the funny thing is that with all my writing books, I didn't realize I was making all these mistakes. After two days of file deletions and new antivirus uploads, my brother has fixed the problem. He said that the malware somehow got embedded in my internet software and was piggy-backing on that. All of it is just too complicated for me to understand, I am just glad that the person who was making changes to my files can't do it anymore. My brother assures me that everything is sorted out, but I am still a little paranoid about being online, especially since he said that is how the malware got installed. He said that I might have visited a website or downloaded something that was infected. I just hope that this is all over. I kind of feel icky about this whole experience. I have antivirus software on my computer, but I still feel kind of paranoid about keeping my writing on my computer from now on. I had a backup on the flash drive and I am thinking of keeping it there and working from it. I don't like the idea of someone just accessing my computer and taking a peak into all my private stuff. Enough of my drama. How is everything with you? Sometimes we all feel discouraged and writing can look more like a mountain to concur than a hill. I know I recently felt like this. But I read the road to publication by Sherrilyn Kenyon and I felt a lot better afterwards. If you ever felt dismayed by your writing, please, just read her story about her struggle and you will feel better, because if she could go through all that she went through and not give up, neither can we. 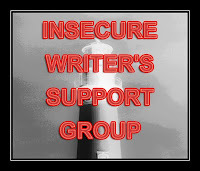 The InsecureWriters Support Group was created by the wonderfully talented Mr Alex J. Cavanaugh, so that writers could talk and communicate to others about the fears and insecurities that they might have. You can visit Alex Here, or if you want to join us in discussing our insecurities on the first Wednesday of each month, you are welcome to join by going Here.